As part of our FILL2030 “Transnational Access” scheme, we attract users from new communities, either in existing Associate and member states or in non-member countries. It is in priority used in the context of new users from non-member countries. 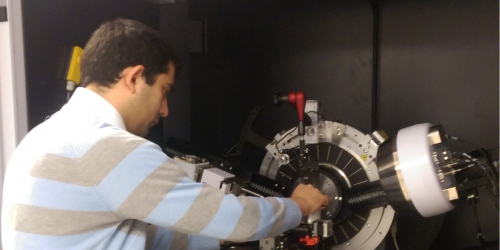 Image: Graduate student working in Prof. Jahed’s research lab at the University of Waterloo (image: Jahed/U. Waterloo). Professor Hamid Jahed has strong research partnerships with automotive companies to develop light-weight materials and advanced manufacturing technologies. Vehicle parts made of light-weight materials, such as magnesium, increase a car’s energy efficiency and make powering it with alternate energy sources more feasible. Advanced manufacturing capabilities, such as 3-D printing, can give parts suppliers a significant advantage by lowering cost or by enabling designs that are difficult or impossible to produce any other way. Prof. Jahed’s research team has been examining the effects of various manufacturing techniques on sheets of magnesium. This research involves careful characterization of the resulting experimental materials, to determine key parameters that affect the durability and lifetime of parts that will be made from the materials. Stress is one such parameter, as too much stress in a material leads to early failures. With the Canadian Neutron Beam Centre closing down, Jahed was forced to look elsewhere for neutrons. He found the Institut Laue-Langevin (ILL) in France to be supportive. “I am very grateful for the openness of the ILL to accommodate our experiments, even though Canada is not yet a member,” says Jahed, speaking not only of the beam time, which was granted free of charge, but also of assistance at the beamline to do the measurements effectively and in using software to begin data the analysis. The ILL is among several facilities that have expressed interest in a partnership with Canada. While some neutron beam experiments could be done domestically at the McMaster Nuclear Reactor, even with upgrades to that reactor, the community of researchers will still need capabilities only available at much brighter neutron sources such as those available at ILL, or similar facilities in the USA (more information about the needs of the research community is described by the Canadian Neutron Initiative). “As a researcher in the field of residual stress and material characterisation, access to the ILL facilities, and collaboration with its scientists is a great opportunity and asset. I hope to continue to send my students there for future experiments,” concludes Jahed.